This is an inspired concoction – fragrant ripe pears, vanilla and a touch of lemon paired with sugary chestnuts from an American source. The aromas were amazing, and the taste sublime. 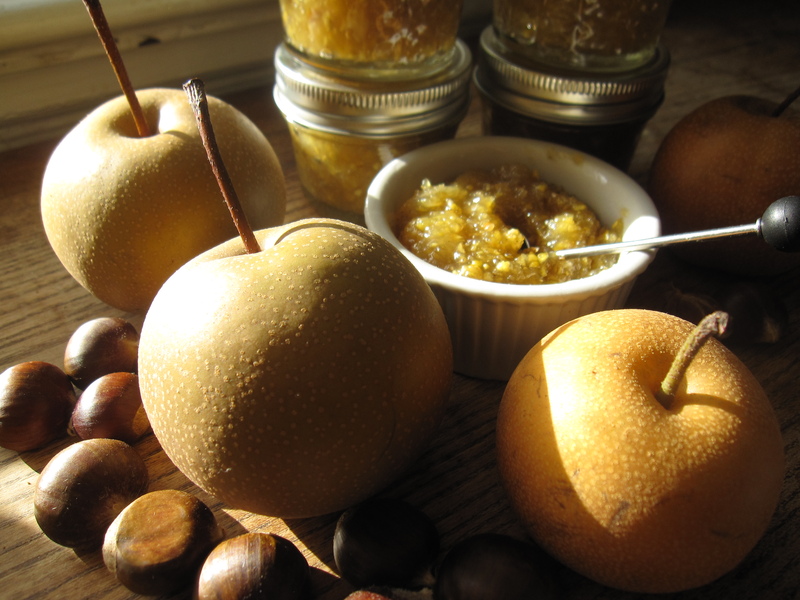 Thank you for choosing pears (along with apples and quince) for the November Tigress Can Jam. This is straight from a Christine Ferber playbook. I lowered some of the sugar content but it was still very sweet. My chestnuts took longer to cook than hers and I did not puree them completely, preferring to preserve the slightly chewy texture of the nuts. While the lovely American chestnut trees of our distant past were wiped out by blight, there are some farmers in the Midwest who are sustainably reviving the industry. Our local health food store snagged a shipment of them a few weeks ago and I could not resist. Okay, not local in the immediate sense of the word, but certainly better than the ones from Italy found in grocery stores at this time of year. The next time I make this (it’s a keeper), I will halve the chestnuts, roast them, lower the sugar even more, and add a spunky seasonal herb like rosemary, sage, savory or thyme. But I will also make the recipe just as is. Peeling chestnuts. These chestnuts were smaller than the ones you usually see, under an inch in any direction, and their skins were not quite so hard to cut. To peel them, cut an X in the rounded side, making sure to penetrate both the outer shell and the inner flaky skin. Working in small batches, pour boiling water over them and let them sit for about three minutes. The easiest ones to peel will be those that sink to the bottom of the bowl. Take them out of the water one at a time. If you squeeze the shell, the X should open and the skins should slip off. Some need the help of a paring knife. Alternatively, you could roast them in a 375-degree oven or in a perforated pan over an open flame. 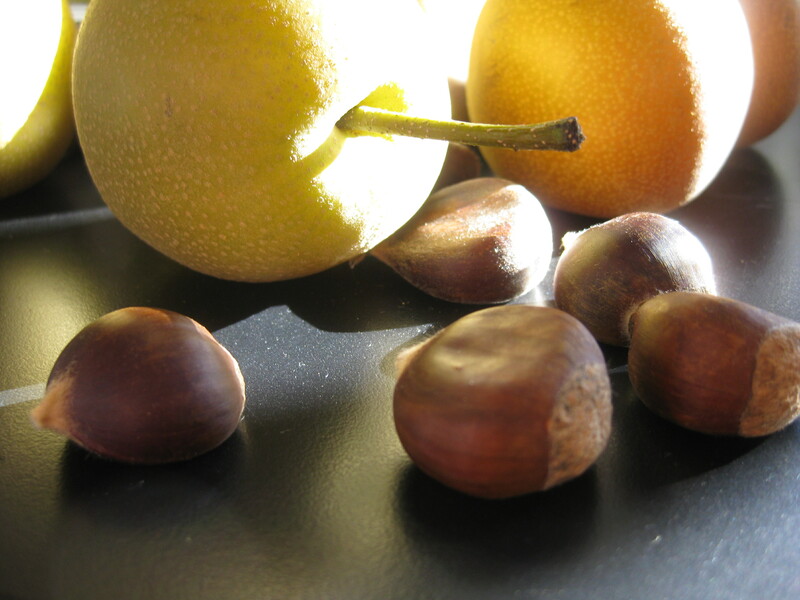 In this recipe the chestnuts and pears are cooked separately and left to macerate overnight. They are once again cooked separately and then combined. Put the ingredients in a large shallow pan and bring to a boil, stirring. Cook for about 15-20 minutes or until the chestnuts are soft (time may vary). Pour into a ceramic bowl, cover with parchment, cool, and set aside in the refrigerator overnight. Place the lemon juice in the bottom of a wide saucepan. 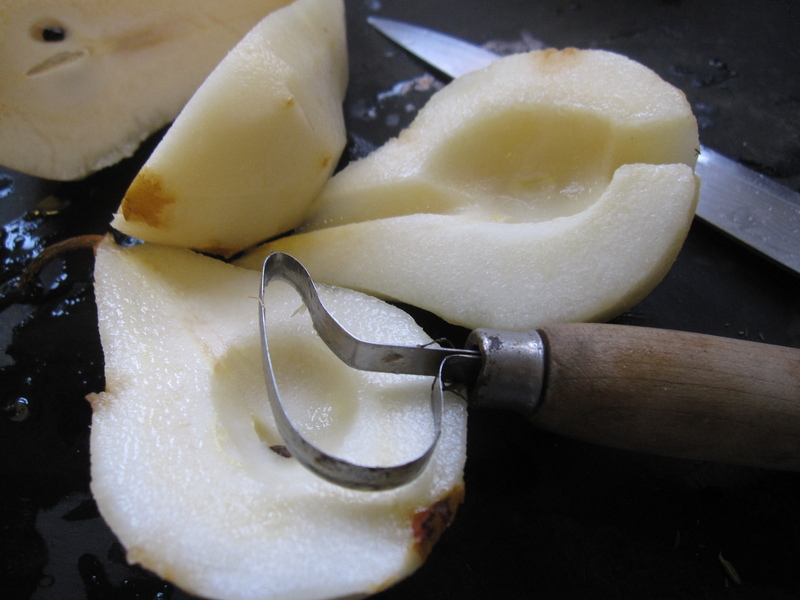 Peel the pears and chop them into small pieces, immediately dropping them into the lemon juice to avoid browning. Add the sugar and vanilla and bring the mixture to a simmer. Pour into a ceramic bowl, cover with parchment, cool, and set aside in the refrigerator overnight. Prepare canning jars and lids and put a plate in the freezer for testing the jam’s set. Cook the chestnut mixture and pear mixture separately over high heat for about 5 minutes, stirring constantly. Combine the two mixtures, bring to a boil and simmer for another 5 or so minutes until the set tests done. Process in a water bath canner for 10 minutes after the water returns to a boil. Turn off the heat, remove the lid and let the jars sit for five minutes until removing to the counter to sit undisturbed until completely cool. I’m curious- there’s not much acid in your recipe. I continue to learn about canning/preserving food and understand you need to take heed of pH and acid levels. Pears and chestnuts are low acid so is the juice of one lemon enough? Thanks Tigress! Actually, the sugar in this recipe is the primary preservative. 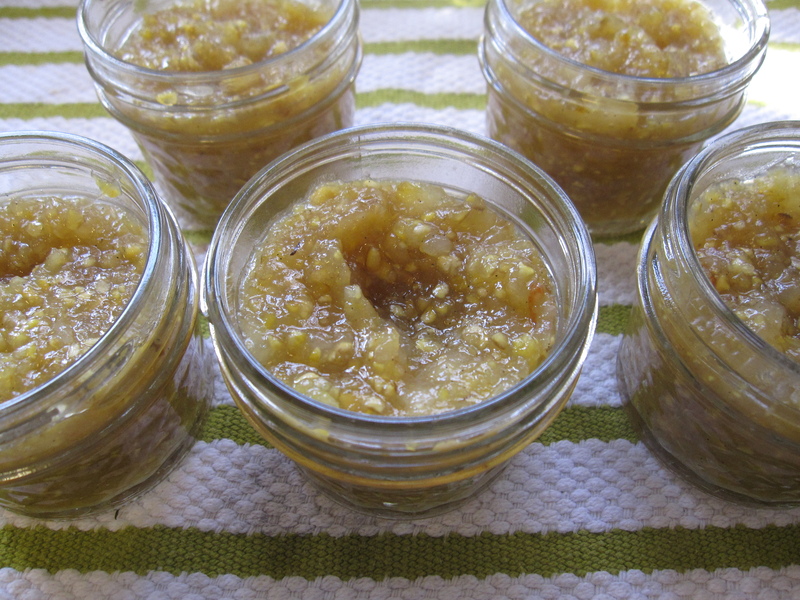 I use lemon to help boost the pectin level to make it gel and to cut the cloying taste of sugar. 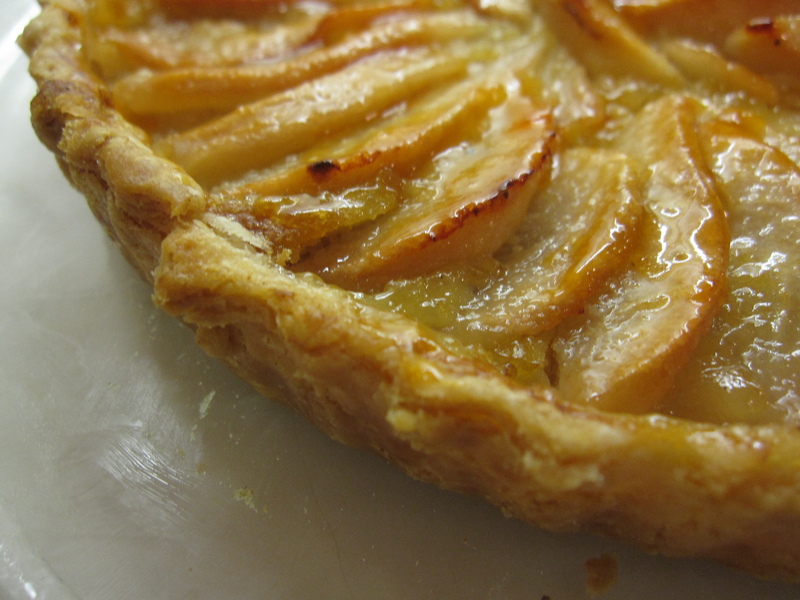 The recipe originated with Christine Ferber, the grand dame of preserving, whom I trust completely. Thanks for the info. I need to go check out Christine Ferber!